Today I was back at Uni for a preview of the fourth year students final work. I don’t really know what I was expecting since I’ve never been to a student show before. Some work I looked at and thought Eh?, others Oooo!, and some Ahhhhh! Our task was to write a review on three pieces. They had to be different in some way (i.e style, technique, like/don’t like) Obviously I was more interested in the knit projects, but there were many others that took my eye. In the end I chose three that I classed as ‘Marmite’ projects. Projects with a love/not love style to them. In one sense they’re not different, but in another, each one brought first an Awww (cute) or Hmmm (Not sure Hmm), followed later with an Oooohhhh, Hmmmmm (deeper thinking Hmm). 1. The one I liked then loved. The ‘Willkommen’ collection is inspired by a dark illustrative story conceived by the theatrical nightmare of historical entertainment. The augmented illustrations that exist somewhere between horror and humour allow for a surreal yet recognisable twist of humanity and nightmare that has been evolved into a collection of wearable art. Willkommen is a collection focused on empowering fashion to exist as a purer expression of self-being, through eccentric aesthetics and the ideals of A-Gender clothing. Ever since we did the Grayson Perry assignment I’ve tried to look at things longer. Instead of walking through a gallery and nodding to things I like I’ve also stopped to look at those I don’t like. My eyes are opening to the story behind the image. In this case I have seen Eves’ work before and liked her style. Her pen and watercolour images are funny with just the right touch of wickedness plus they connect to my inner goth. The project is based on nightmares and horror, with a touch of humour. Like the poltergeist films where the clown, created to be funny, becomes one of the scariest parts of the film. Her images are based around a circus theme, a story of characters in a circus of nightmares. And suddenly I’m in her world, loving the heavy glaring almost monster like men in their oversized sweaters, although I don’t know the story, I feel as though I can see it. The presentation did the project justice, golden brown copper piping holding amazing knit samples made on the Brother knitting machines. The colour scheme was subdued almost pastel, but (if this is possible) the dark side of pastels. Oh yes, everything nice like clowns, ringmasters, jugglers, but with a little amount of horridness. I loved the idea of drawing on white leather and the brass frame looked fantastic. 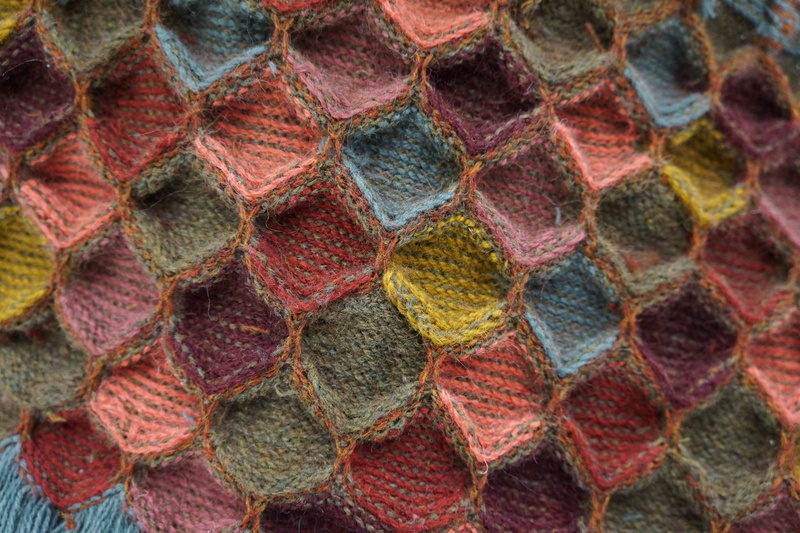 The knitted techniques used were complex and appealing, there were a few samples that showed the knitted techniques and thought process on them, but these seemed a bit lost amongst the sketches. It could be that an overuse of drawings could hide the importance of the knitted structure. I found myself taking time to look at the drawings and admiring them more than the knit – which is a worry when Eve is trying to show her textile talent. I liked the way she kept her journals, writing in her own hand rather than typing out words, yet she took time to imagine how things would look on the page before writing. I finally found sense in having designers I like and am inspired by, her journals felt fresh and uncluttered, but helped link her final ideas to her thought process. Is this the type of show I want to present? Although knit is my specialism I am not sure I see myself making final pieces like this. I want to know the techniques used and be able to use them in my work, but I see myself doing something different. I love the presentation of her work and hope when it comes to my turn I’ll be able to show my ideas in as clear and pulled together way as she has. I’ve taken some ideas from her way of presenting knit samples and will put some thought into my research journals (which over the first year has gone from what is research to I need to do more research). A project inspired by the increasing issue of gender stereotypes and idea of gender neutrality in child’s play combined with the quintessential familiarity of the idea of ‘home’. ‘Little Homes’ investigates, and working alongside Fourdot Ltd and Applelec, proposes a series of functional and inspiring lighting products for children and the home. Full of creativity, they’re designed to encourage storytelling and fuel imaginative play, creating an interactive and sensory experience to intrigue your child’s curiosity. Through the ability to pick and mix panels forming the light’s façade, they can create unique combinations to discover their own little world. At first glance I saw Megans houses and thought, pretty and walked on. Then I looked again. Yes, they make nice lights. But they are so much more. They are welcoming, interactive play scenes for imagination (something that computer games seem to be stealing from growing minds). They are well thought out scenes that allow story telling through play. The square lamps illuminate and cast pictures and shadows on walls and surfaces to make even bigger play areas. There are little clear pieces with fish on that can be added to the waves of the sea. Children can make characters to expand the story and have endless adventures. Something I’ve been exploring myself through my doll making recently is the idea that dolls are for girls. Who says so? The idea of pink being for girls and blue for boys has been around far too long. Megan explores the idea of gender stereotyping through toys in some well presented books. Why can’t girls have blue rooms? My latest patterns for the My Little Crochet Doll have been aimed towards boy doll ideas. Cowboys and Spacemen. But hang on, even I label them as cow BOYS and space MEN. As though the careers go to the boys and the ballet outfits go to the girls. This stereotyping is ingrained into our beings from such a young age that we don’t recognise it as a hindrance. Does is go even deeper, are we damaging children or rather not allowing children to reach their potential by forcing children into a mould? These are questions raised by Megan through her work with the little houses. How can we create play as a gender neutral place? Can we create toys that are beautiful, useful, simple and allow children to grow? The presentation was in a smaller space than the other two I chose, but the space was used to it’s potential and perhaps more room would give a different feel that wouldn’t work so well. I really enjoyed the books that came with the presentation. The smaller ones (shown in these images) show photos of children using the light as it should be whilst the other book was an explanation on her research into traditional play (pink and blue separation). The light was made using lazer cut pieces in wood and perspex, painted or dyed I’m not sure, but a simple and effective way to let light through. It looked as though the panels could be taken apart and put together, thus adding to the possibilities and allowing a child to chose their own panels for the lighting. However the wood chosen looks fragile. I don’t know how strong this would be if taken apart several times. I linked closely to the thoughts behind this project, as someone looking into toys and gender (or why can’t dolls belong to boys) I found it very interesting. I also found myself returning to something that I love… toy and doll making. This morning I was handed some results from my last assessment, there was the suggestion that my work looked commercial rather than my own designer maker style. That’s quite something for those who remember my posts when I first started Uni. I spent some time wondering where I was heading. There is a part of me that feels lost. In a way I feel as though I don’t quite know what I am about, while everyone else seems to know. I’m sure that’s not true and we’re all feeling lost, but I wonder whether I’ll ever get back to making dolls. There are so many things at University that I want to try out. I want to master all the knit machines and computer programmes they can throw at me, but in my almost addiction like need to learn, I worry that I will lose the things I love. 3. The Marmite one – I like it, but don’t like it. Led by a passion to source and produce within the UK, Rowson-Jones has combined local heritage and natural materials to create a garment which holds its own story. Each material has been carefully gathered within Yorkshire, with the use of hand picked berries from Hanging Stone Road, Huddersfield, beautiful alpaca yarn from Summer Wine Alpacas, Holmfirth, preserved cotton from the original Belle Vue Mills, Skipton. Made up of both rainwater and Hedera helix, the natural ingredients and dye process have resulted in the garment to be one of a kind. The jumper has been crafted for a high-end unisex market. Most people would assume this would be my favourite project in the show. I liked it and it’s something that’s close to my heart and something I’ve been wanting to explore a lot more. This idea of locally sourced yarn is something I am passionate about as a spinner and knitter. I remember the first time I bought a ball of wool I could trace all the way back to the sheep and the sense that I had found something so precious will stay with me for a long time. I still have one of the balls of wool I bought that day. It’s from a sheep called April who lives in a field just outside of York. Her owner sheers the sheep, washes the fleece and even spins it herself. Talk about locally sourced, that ball of wool has yet to leave Yorkshire! You can’t get better than that. The wool though is rough, too rough for garments next to the skin. Well, of course it’s rough. It’s British wool. From British sheep. And that’s where I don’t like this project so much. I love the idea of locally sourced and one reason is that it often helps local people, people who need local buyers to help keep their livelihoods going. I often hear people talking about the dreadful situation we’re in by allowing our garments to be produced overseas. Tales of factories being closed down as products are outsourced for lower paid workers, often leading to bad conditions and dreadful disasters where factories are so badly managed that they collapse. This is one of the main reasons I suspect, that people are choosing locally sourced over overseas products. I hear people talking about their favourite yarn companies telling me how it’s a local company, until I point to the small print on the label that says, produced in Turkey. Our once large spinning mills are now museums struggling to survive with the small funding they receive and my county is littered with once thriving factories. Sourcing locally keeps what workers we have left in business and is important. Amy’s fibre was locally sourced, the berries for dyeing were hand picked locally, the water used was rain water (even the tap water was seen as unsuitable for this economical jumper). Everything was done to give you the impression of local, economical, resourceful, community, traditional back-to-basics way of making. Made in Britain. The fibre (because technically it isn’t a wool) was spun in a factory outside of Yorkshire. While there are many hand spinners in Yorkshire who would have happily hand spun the fibre, keeping with the tradition that Amy seemed to aim at, she chose to machine spin the fibre. I just don’t think it hit the mark. The natural dyeing process is a good idea, but I think (and might be a bit harsh here) it could have been better. While the jumper is aimed at a high end market it looks muddy, almost dirty in colour. Part of that is the inconsistency with the dye. darker and lighter in parts. This might be because the yarn was dyed in a skein and not dyed accurately. If the dye had been added prior to spinning the fibres they would have blended more evenly and given a more consistent colouring. There’s a part of me that wishes she had just left the yarn in it’s natural state. A lovely white alpaca was sourced, so why dye it grey? Alpacas are beautiful animals more related to camels than sheep, so produce lovely soft fibre that is a pleasure to spin and knit. I’d like to say I refuse to buy alpaca from British farms, but last year I was offered a real bargain, a whole fleece for £5 and I couldn’t turn it down. Alpacas are native to Peru, where they have a wonderful system that means every alpaca owner, whether big ranch owner or small farmer in poverty gets the same fair price of his fleece based on quality of the animal. Buying Alpacas from Peru supports the small farmer who relies on us for his livelihood. Without us, without the alpaca trade, he would not be able to support his family. It’s that important. As much as I hate losing our trade to overseas I hate the idea that we are in return taking trade away from Peru farmers. And I have another pet annoyance. Alpacas are not cheap. Really not cheap. While you can often pick up a sheep for £10 Alpacas will cost you between £2,000 and £3,000. This is not a project for the poor! To have alpacas in the UK you need some money behind you. The field, food, vets are just one of the many costs. As someone who is working with Leeds Poverty Truth and Churches Action on Poverty I cannot buy British alpaca fleece from a rich owner, knowing I am taking trade from a poorer owner in Peru. I say again, I love the concept, but for me it missed the mark. However, I enjoyed the concept and it brought me back to my love of wool. The same teacher who suggested I was turning to designer maker also suggested I made yarn for my project. I wanted to, but couldn’t quite see the idea in full. I’ve spent my year listening to designers I like, and looking at trends of the season and I panicked thinking while others are designing garments and fashion, my hand made yarn would look like a poor effort. It just didn’t seem to be what ‘they’ wanted. I feel lost because I’m not following my passion, I’m trying to fit into what I think is required. I might not have liked how the concept turned out, but it got me spurred into action. I need to return to my first love, finding locally sourced British wool, from British sheep, spun or dyed in traditional ways. Type in italics is the individual students statement from the University.